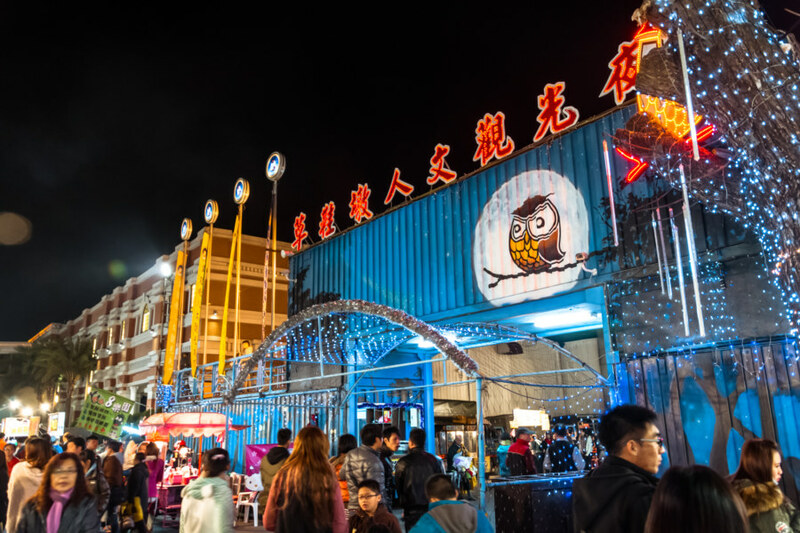 Caotun Night Market offers a jarring architectural mix of ersatz vintage brickwork and owlish shipping container chic. Tonight I visited one of the biggest night markets in Nántóu 南投, the Cǎoxiédūn Tourist Night Market 草鞋墩人文觀光夜市 in Cǎotún 草屯. 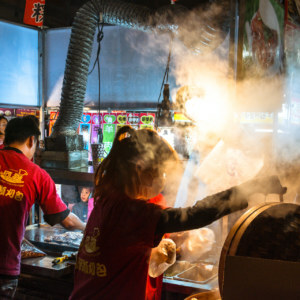 Located at the north end of town, the sprawling open air Caotun Night Market offers a somewhat unusual twist on the Taiwanese night market formula of meals, snacks, drinks, cheap goods, clothing and accessories, and fairground games. 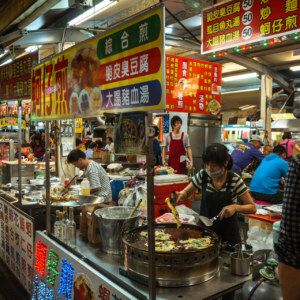 I have now visited more than a dozen night markets in this area of Taiwan and this one definitely stands out. 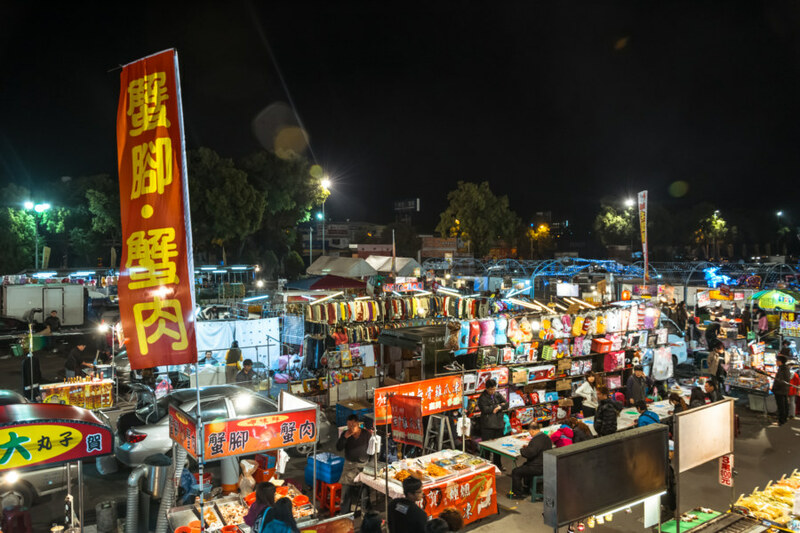 Caotun Night Market is located on the grounds of Taiwan Times Village, a hokey-sounding theme park (or perhaps shopping mall) that pays tribute to an imagined Taiwan of yore. I haven’t actually been inside (though I plan to someday) but it has the look of a place that is destined to be abandoned, much like Taiwan Folk Village 台灣民俗村, a similarly nostalgic mega-project on the opposite side of the Bagua Mountain Range 八卦山脈. 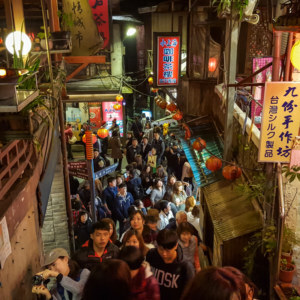 Actually, this ersatz attraction is no more than a few years old whereas the history of the night market extends back to 1992 by some accounts. 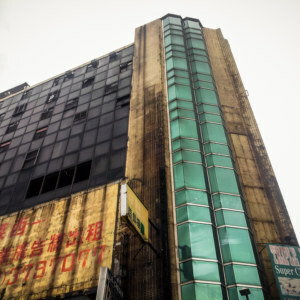 In this sense it is the Taiwan Times Village that occupies the grounds of Caotun Night Market, not the other way around. At the gates to Caotun Night Market: “cultural care hospitality”. At any rate, this night market is pitched as something more: a cultural tourist night market, whatever that means. Having been I can’t say I understand what the hype is all about. 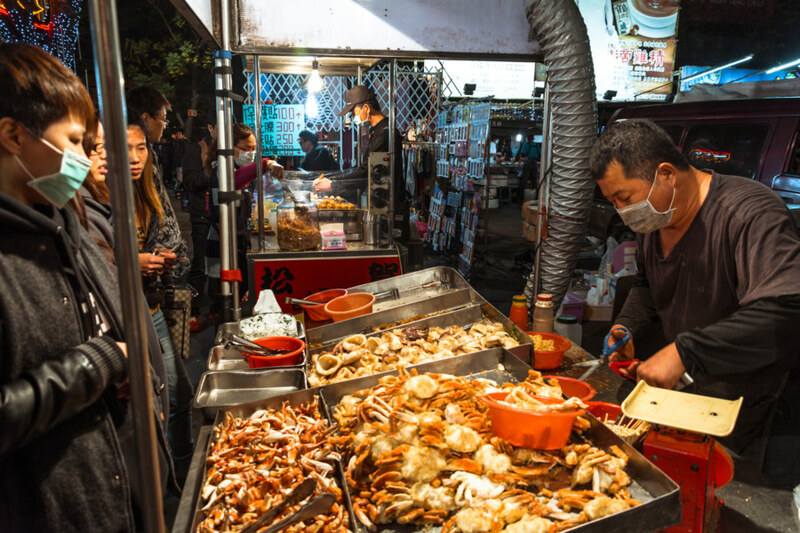 It certainly isn’t a bad night market—assuming you like night markets, anyway—but I see no cultural value above and beyond what you’d usually find in such a place. 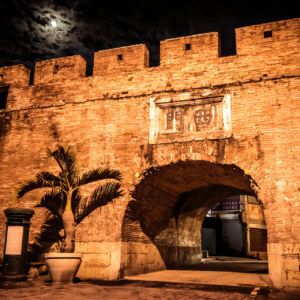 If the “culture” part refers to the hulking building off to the side then why not open it up when the night market is on? Perhaps I need to return on a Saturday night. Famous fried chicken. I seldom sample this beloved Taiwanese snack but was impressed with the tenderness of the piece I sampled from this stall. 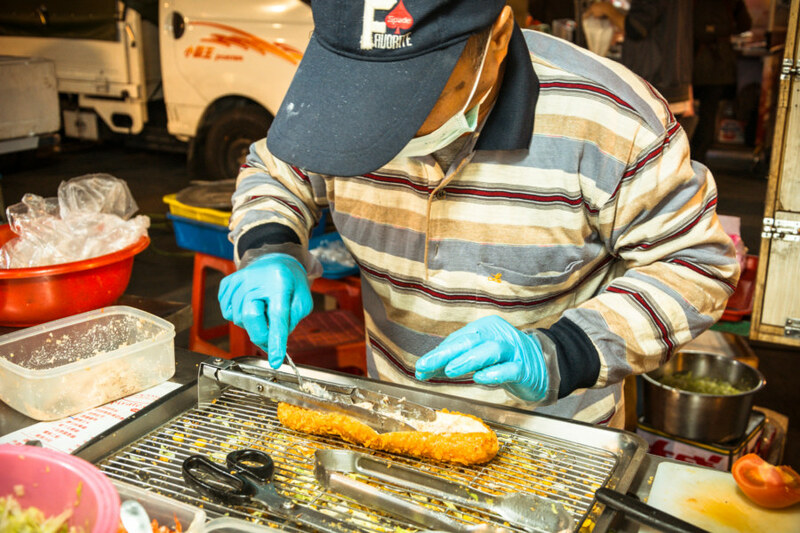 A cute old man working hard to prepare a deep-fried sandwich, a somewhat rare but not entirely unique Taiwanese night market snack. Making broad generalizations about the food at any large Taiwanese night market isn’t particularly helpful. 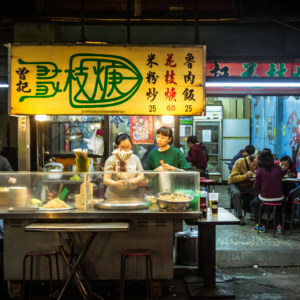 There’s only so much you can eat in a night—and I almost always go into night markets blind to what Taiwanese people consider to be exceptionally good or famous1. I enjoyed some fried chicken (a rare indulgence for me), tolerated a deep-fried submarine (hold the mayo), stomached an oyster omelette (not my favourite Taiwanese snack but I keep sampling it waiting to be convinced), polished off an order of piping hot red bean and ginger broth dessert with gusto, and left with a sack of giant chestnuts (locally known as lìzǐ 栗子), steamed and unsweetened. 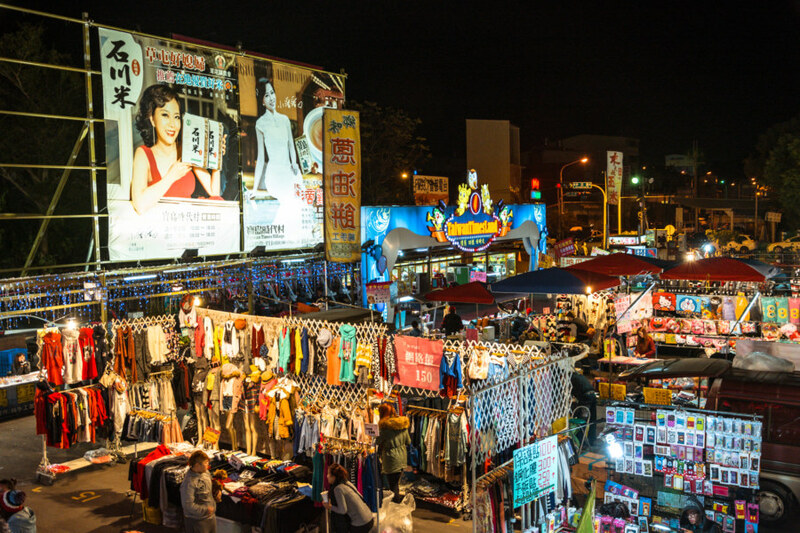 Overlooking the entrance to Caotun Night Market. Looking into the heart of the night market. Here you can see seating for one of the small open air restaurant. 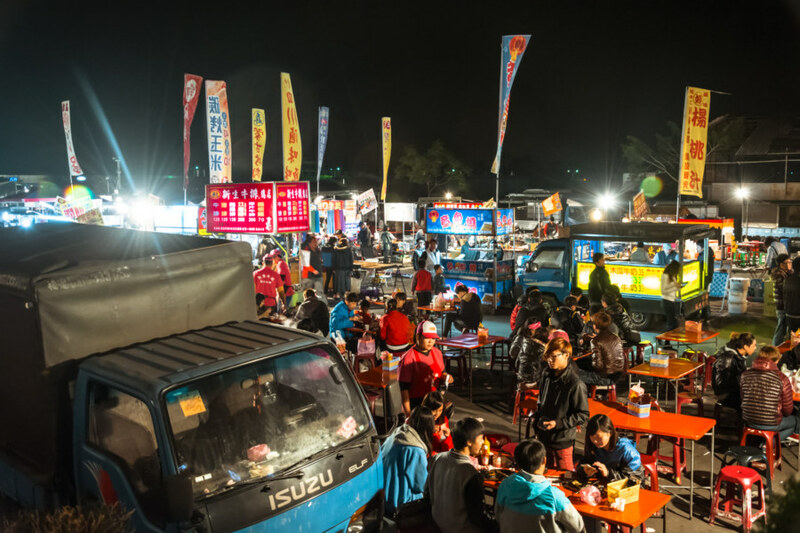 While I was there I also happened to notice a bunch of Mongolian barbecue stalls (which are neither Mongolian nor barbecue, strangely enough), a truck serving pizza-sized green onion pancakes, and the usual assortment of saltwater chicken, luwei, and barbecue vendors. 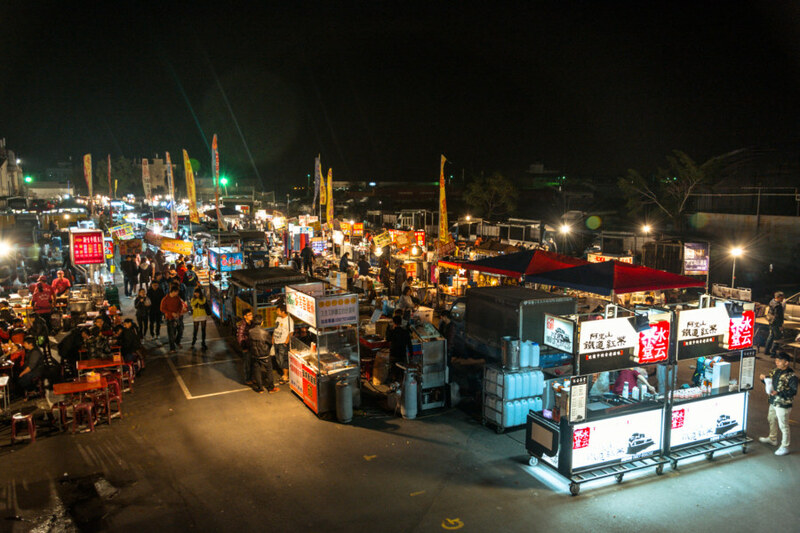 Overall the food selection was not all that different from that of Jīngchéng, the biggest night market in nearby Changhua City 彰化市. 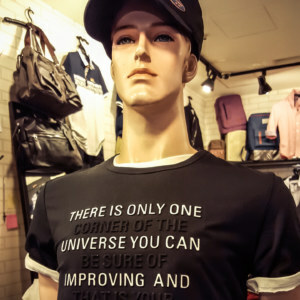 I can’t comment too much on the cheap goods and clothing as I pay little attention to either apart from keeping an eye out for amusing examples of Chinglish. 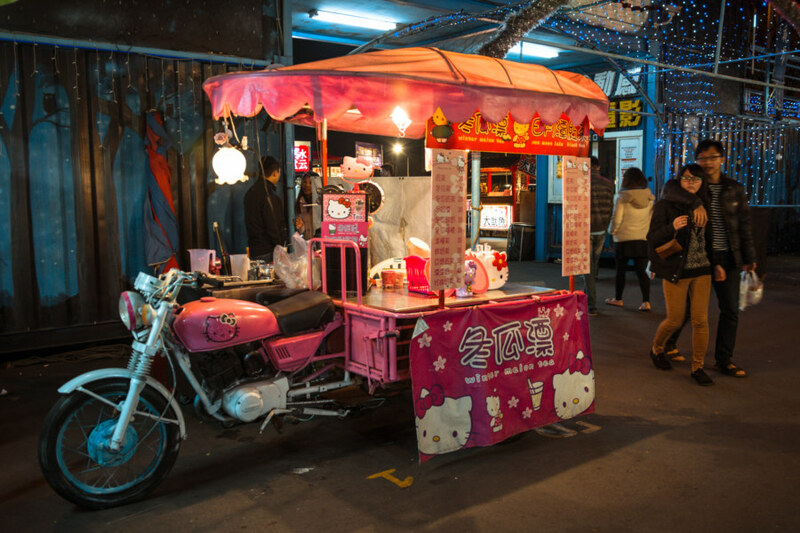 Hello Kitty motorbike tea stall. How badass is that? 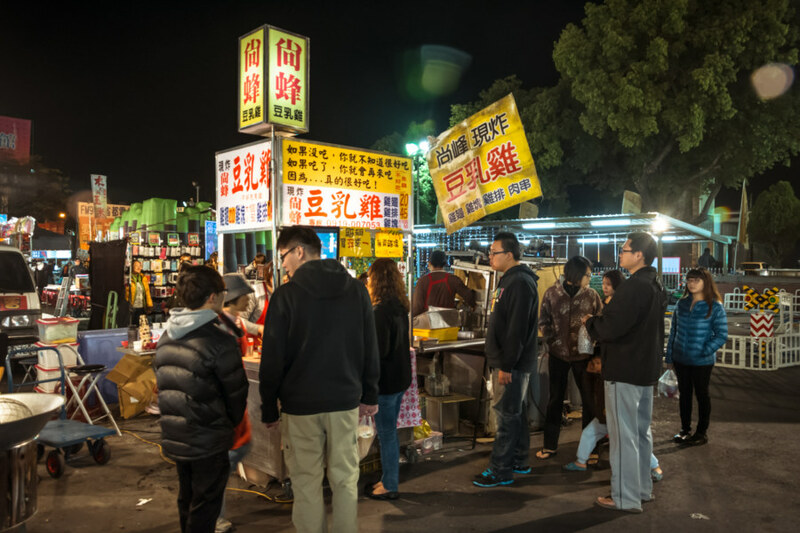 You may notice from some of these photos that the night market wasn’t particularly busy. I can’t actually recall the last time I visited a major night market on a weekend without seeing big crowds. I know it’s only Friday but still—the place looked almost empty at times. I suspect the intrusion of the mega-project next door probably has something to do with this. Then again, my sample size is only one. It might have been a slow night. 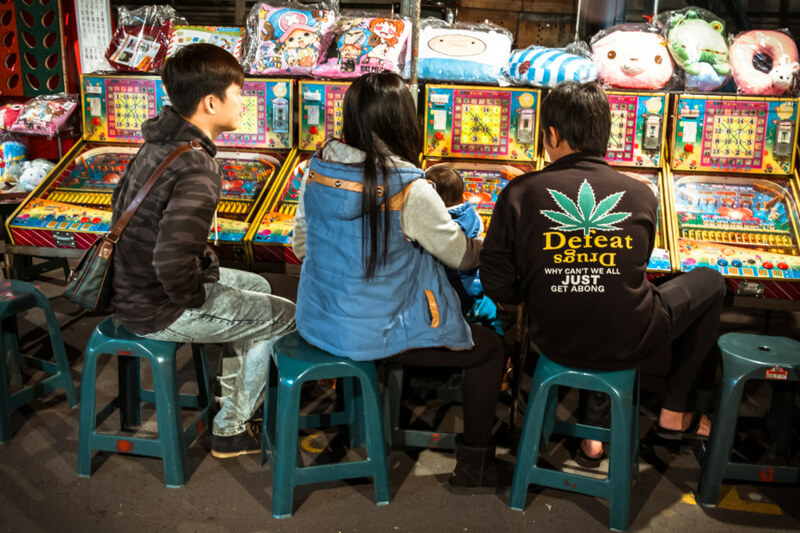 Caotun Night Market is absolutely swamped with games to play. Here some children get a bit of extra help. Another thing that bewildered me was the sheer number and variety of fairground games available at Caotun Night Market. 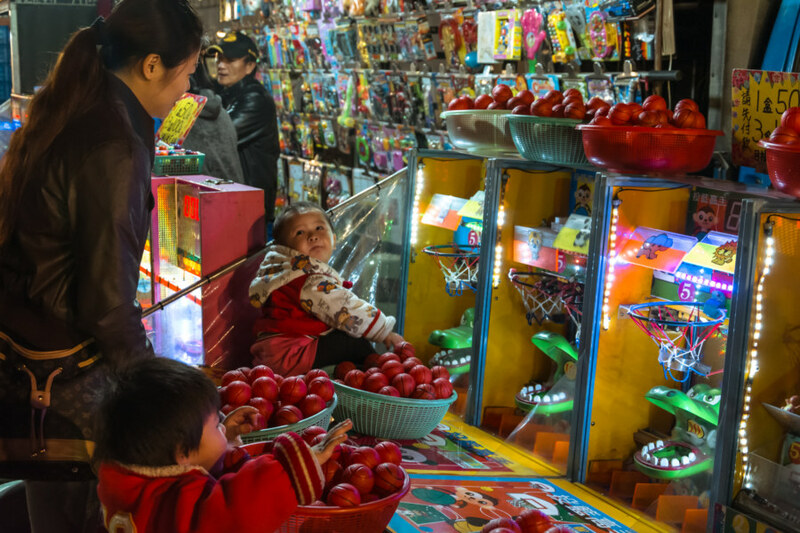 There were many shiny and new games and rides out front and the back of the night market was absolutely packed with crusty old things that have been kicking around for decades. I am not a player of night market games so I can’t comment on the quality of the experience but I imagine connoisseurs of such activities would have much to enjoy at Caotun. Sampling snacks at Caotun Night Market. Fried seafood by weight. I was tempted by the crab but it sounded rather expensive for night market fare so I didn’t end up trying any. Why can’t we all just get a bong? 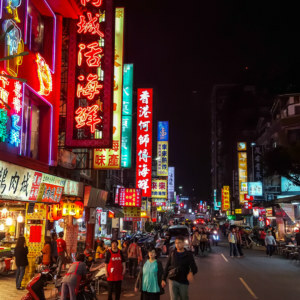 Another curious feature of this night market is the notoriety of its chairman, Chiang Chin-liang 江欽良 (sometimes Jiang Cing-liang), a former gangster and ex-con turned night market tycoon. 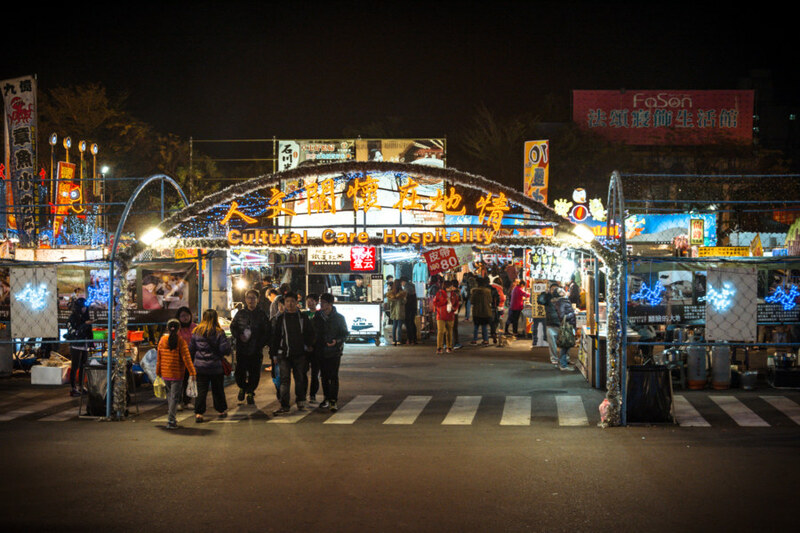 Naturally it was Chiang that spearheaded the development of the Taiwan Times Village, transforming this night market into what it is today. And, if I have understood this story correctly, the grand opening of the theme park was marked by his marriage to Little Pin-Pin 小潘潘, a minor celebrity whose likeness overlooks the market stalls. Huge posters of the night market tycoon’s celebrity wife can be seen at the back. 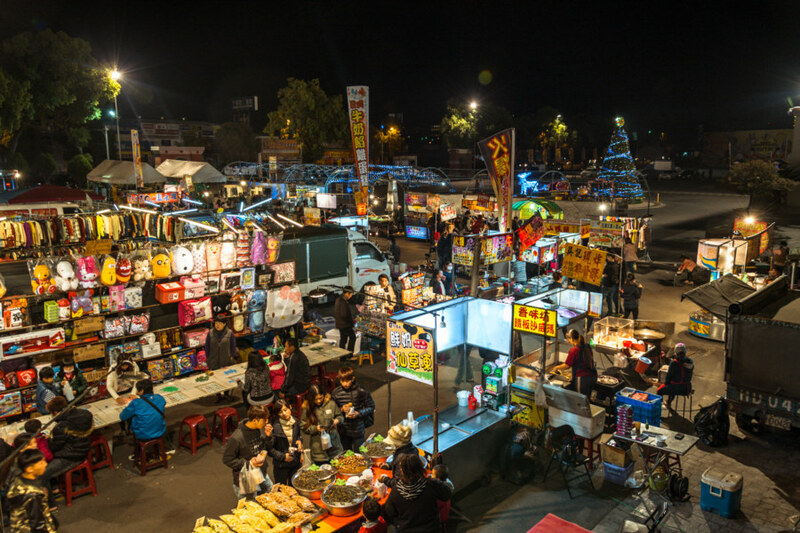 The outer stalls at Caotun Night Market. 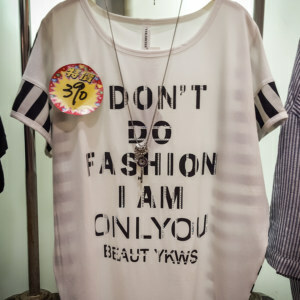 Lots of night market fashion, pre-made drinks, barbecue, and the like. An overhead shot of the stalls at the back of Caotun Night Market. 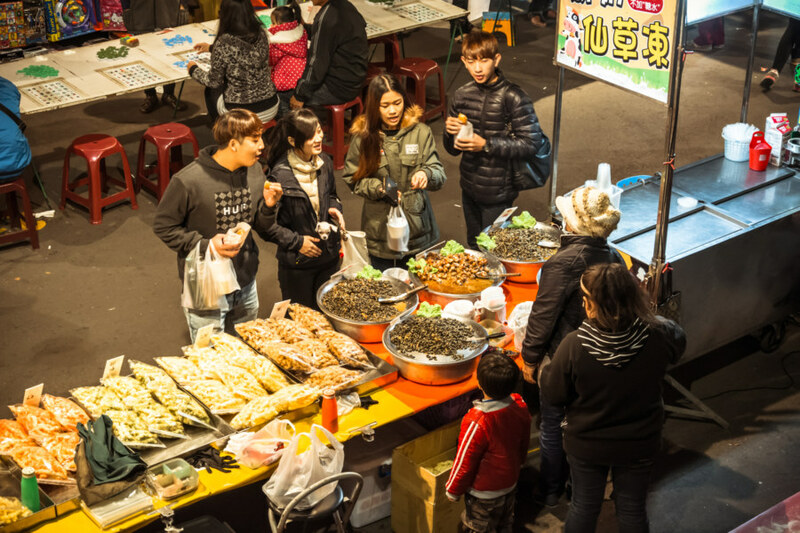 Overall I would say that Caotun Night Market isn’t exactly worth going out of your way for—but it certainly has something to offer night market aficionados like me. 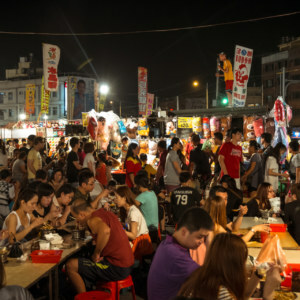 If you’re interested in visiting: according to this list of Taiwanese night markets on Wikipedia (in Chinese) the night market is open on Fridays, Saturdays, and Sundays until 11:00 pm. Read more about this night market in Chinese here, here, and here. Finally, for more about Cǎotún 草屯 browse the archives at The Daily Bubble Tea.